"Happy New Year!" That greeting will be said and heard for at least the first couple of weeks of 2013 as a new year gets under way. But the day celebrated as New Year's Day in modern America was not always January 1st. The celebration of the new year is the oldest of all holidays. It was first observed in ancient Babylon about 4000 years ago. In the years around 2000 BC, the Babylonian New Year began with the first New Moon (actually the first visible crescent) after the Vernal Equinox (first day of spring). The beginning of spring is a logical time to start a new year. After all, it is the season of rebirth, of planting new crops, and of blossoming. January 1, on the other hand, has no astronomical nor agricultural significance. It is purely arbitrary. The Babylonian new year celebration lasted for eleven days. Each day had its own particular mode of celebration, but it is safe to say that modern New Year's Eve festivities pale in comparison. Although in the first centuries AD the Romans continued celebrating the new year, the early Catholic Church condemned the festivities as paganism. But as Christianity became more widespread, the early church began having its own religious observances concurrently with many of the pagan celebrations, and New Year's Day was no different. New Years is still observed as the Feast of Christ's Circumcision by some denominations. 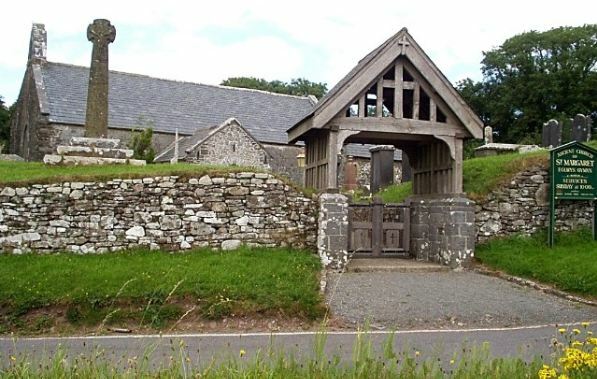 During the Middle Ages, the Church remained opposed to celebrating New Years. January 1 has been celebrated as a holiday by Western nations for only about the past 400 years. Other traditions of the season include the making of New Year's resolutions. That tradition also dates back to the early Babylonians. Popular modern resolutions might include the promise to lose weight or quit smoking. The early Babylonian's most popular resolution was to return borrowed farm equipment. The Tournament of Roses Parade dates back to 1886. In that year, members of the Valley Hunt Club decorated their carriages with flowers. It celebrated the ripening of the orange crop in California. Although the Rose Bowl football game was first played as a part of the Tournament of Roses in 1902, it was replaced by Roman chariot races the following year. In 1916, the football game returned as the sports centerpiece of the festival. The tradition of using a baby to signify the new year was begun in Greece around 600 BC. It was their tradition at that time to celebrate their god of wine, Dionysus, by parading a baby in a basket, representing the annual rebirth of that god as the spirit of fertility. Early Egyptians also used a baby as a symbol of rebirth. Although the early Christians denounced the practice as pagan, the popularity of the baby as a symbol of rebirth forced the Church to reevaluate its position. The Church finally allowed its members to celebrate the new year with a baby, which was to symbolize the birth of the baby Jesus. The use of an image of a baby with a New Years banner as a symbolic representation of the new year was brought to early America by the Germans. They had used the effigy since the fourteenth century. Traditionally, it was thought that one could affect the luck they would have throughout the coming year by what they did or ate on the first day of the year. For that reason, it has become common for folks to celebrate the first few minutes of a brand new year in the company of family and friends. Parties often last into the middle of the night after the ringing in of a new year. It was once believed that the first visitor on New Year's Day would bring either good luck or bad luck the rest of the year. It was particularly lucky if that visitor happened to be a tall dark-haired man. Traditional New Year foods are also thought to bring luck. Many cultures believe that anything in the shape of a ring is good luck, because it symbolizes "coming full circle," completing a year's cycle. 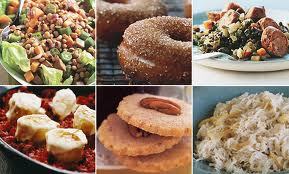 For that reason, the Dutch believe that eating donuts on New Year's Day will bring good fortune. Many parts of the U.S. celebrate the new year by consuming black-eyed peas. These legumes are typically accompanied by either hog jowls or ham. Black-eyed peas and other legumes have been considered good luck in many cultures. The hog, and thus its meat, is considered lucky because it symbolizes prosperity. Cabbage is another "good luck" vegetable that is consumed on New Year's Day by many. Cabbage leaves are also considered a sign of prosperity, being representative of paper currency. In some regions, rice is a lucky food that is eaten on New Year's Day. 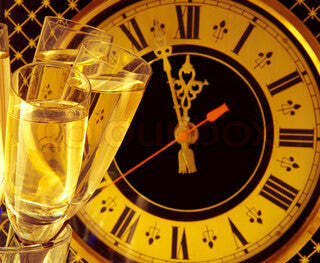 One of the most venerable New Years traditions is the champaign toast at midnight to ring in the new year. Toasting can be traced back to the ancient Romans and Greeks who would pour wine, to be shared among those attending a religious function, from a common pitcher. The host would drink first, to assure his guests that the wine was not poisoned. Poisoning the wine was a fairly common practice in ancient times, designed to do away with one's enemies. In those days the wine was not as refined as it is today so a square of burned bread (toast) would be floated in the wine bowl and then eaten by the last person to drink. The bread was put there to absorb the extra acidity of the wine in order to make it more palatable. Eventually, the act of drinking in unison came to be called a toast, from the act of "toasting" or putting toast into the wine. The song, "Auld Lang Syne," playing in the background, is sung at the stroke of midnight in almost every English-speaking country in the world to bring in the new year. At least partially written by Robert Burns in the 1700's, it was first published in 1796 after Burns' death. Early variations of the song were sung prior to 1700 and inspired Burns to produce the modern rendition. 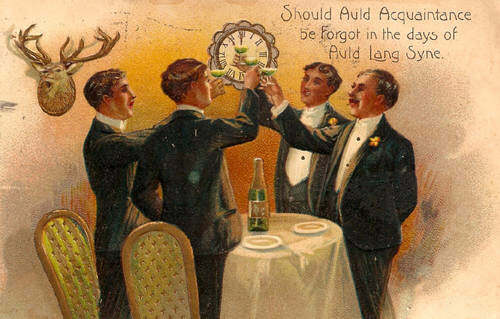 An old Scottish tune, "Auld Lang Syne" literally means "old long ago," or simply, "the good old days."